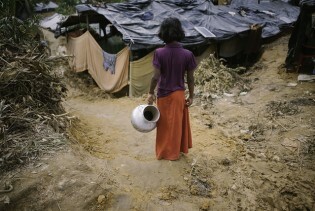 The Rohingya are a minority community living in Rakhine State in Myanmar. The Muslim Rohingya are considered intruders into Buddhist Myanmar - illegal immigrants from bordering Bangladesh. They have been always discriminated against, looked down upon, ostracized, and denied any civil and judicial rights. Thousands of Rohingya refugees in camps in Cox’s Bazar, the southern-most coastal district in Bangladesh, protested on Thursday, Nov. 15, against an attempt to send them back to Myanmar. Policies that allow for impunity, genocide, and apartheid are “intolerable” and make repatriation of Rohingya refugees impossible, say United Nations investigators. Over one year ago, Bangladesh opened its doors in response to what is now the world’s fastest growing refugee crisis. But questions still remain on how to rehabilitate the steadily growing population. After the release of a scathing report on Myanmar’s human rights violations, next steps to achieve accountability and justice remain elusive and uncertain. August 25, 2018 marked one year since violence erupted in Myanmar’s Rakhine State, triggering the massive Rohingya exodus to neighbouring Bangladesh. As the crisis continues with no immediate end in sight, it is crucial to expand and sustain health and life skills services for Rohingya women, girls and youth to locate opportunities amid challenges. At 12, Mohammed* is an orphan. He watched his parents being killed by Myanmar government soldiers a year ago. And he is one of an estimated half a million Rohingya children who have survived and been witness to what the United Nations has called genocide. Aid funding for refugee relief is running out while conditions are still not in place for the safe return of over 700,000 people forced to flee Myanmar to neighbouring Bangladesh after violence broke out one year ago. Despite having the strong support of influential global leaders, Bangladesh has "missed" the opportunity to mobilise the world’s superpowers and place pressure on Myanmar to allow for the repatriation of the Rohingya refugees. The lead-up to the Australia-ASEAN Summit in Sydney on 16-18 March 2018 was characterised by widespread and well-publicised protests in Sydney against human rights abuses occurring in several ASEAN member countries – namely Cambodia, Myanmar and Vietnam. A devastating fire in a shanty at Kalindi Kunj, a New Delhi suburb, that gutted the homes of 226 Rohingya refugees from Myanmar, including 100 women and 50 children, has trained a spotlight on India's ad hoc policy on international migrants. In recent months, international media coverage of Myanmar has focused on the plight of the Rohingya people in the west of the country. And for good reason: Since August 2017, brutal army attacks on this Muslim ethnic minority have sent more than 750,000 people — 90 percent of the Rohingya population living in Rakhine state — fleeing over the border to Bangladesh, in what can only be described as a coordinated campaign of genocide. In the wake of persistent violence against the Rohingya community, UN officials have expressed growing fears that genocide is being incited and committed in Myanmar. In the semi-lit makeshift tent covered with strips of cardboard, five women sit in a huddle. As their young children, covered in specks of mud and soot, move around noisily, the women try to hush them down. Hollow-eyed and visibly malnourished, all the women also appear afraid. More than half a million Rohingya refugees crammed into over 30 makeshift camps in Cox’s Bazar in southeast Bangladesh face a critical situation as the cyclone and monsoon season begins in a few weeks’ time. Nobel Laureates, Mairead Maguire (Northern Ireland), Shirin Ebadi (Iran) and Tawakkol Karman (Yemen) speak to Rohingya refugees stranded in the no-man’s land between Myanmar and Bangladesh. They promise to seek justice for the Rohingya genocide. With discussions underway between Bangladesh and Myanmar about the repatriation of more than a half a million Rohingya refugees, many critical questions remain, including how many people would be allowed back, who would monitor their safety, and whether the refugees even want to return to violence-scorched Rakhine state. The repatriation of Rohingya refugees driven from their villages through violence and terror appears uncertain, with critics saying the agreement legalising the process of their return is both controversial and impractical. Hundreds of thousands of Rohingya refugee women from Myanmar are currently living in the cramped camps along Bangladesh Myanmar border. Victims of sexual and physical violence in the Rakhine state, women have been disproportionately affected by this crisis and these women’s perils are far from over in the host country as they continue to face multifaceted challenges. Ferdous Begum was cleaning her child after he had defecated in the open, using leaves she collected from a nearby tree at Bangladesh’s Teknaf Nature Park. The settlement is packed with Rohingya refugees who fled military persecution in Myanmar since August.